FORT WAYNE, Ind. -- Many people dream of backpacking across Europe, but an Indiana man is saying he'll actually be the backpack, CBS affiliate WANE-TV reports. 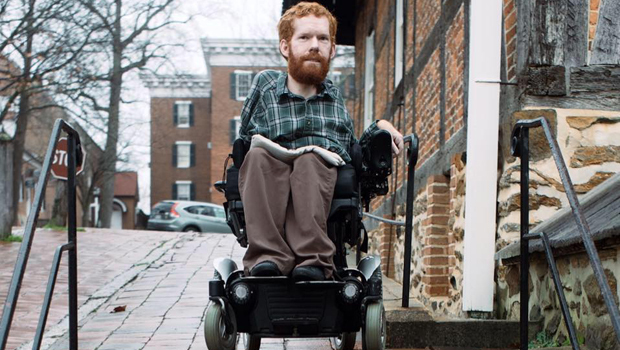 Kevan Chandler was born with muscular dystrophy, a disease that causes progressive muscle weakness. On any given day, you can find him in his wheelchair writing at Fortezza Coffee, composing adventures of love and sacrifice. "That's a story that never gets old," he said. "Even after we've heard it and after we've learned it, we need to be reminded of it." An adventurer himself, Chandler has explored the sewers of Greensboro, North Carolina, in 2013. "It was cold and wet and infested and as gross as you would expect, but it was awesome," he said. Chandler's four traveling companions took turns carrying their 65-pound friend on their backs with a customized backpack equipped with padding, a backrest and saddle. They believe his muscular dystrophy doesn't make his dreams any smaller than theirs. "Considering the guys that were carrying me, I was much taller than I'm used to being, so that was fun," he said. Chandler then began believing the sky was the limit. He and his friends wondered what adventure they could go on next. They started a GoFundMe campaign and created a blog, titled We Carry Kevan, with a plan to backpack through Europe from June 19 to July 8. Over those three weeks, they plan to view wonders in France, England and Ireland. Chandler said the catacombs, gardens and monasteries they want to see would normally be inaccessible to him. "These guys want to make this happen," he said. "They want to serve me in this way." He said he wants their story to be an example for the world. "We are all broken in some way or another, and so we all need our burdens to be held up and carried by each other, and the only way that's going to happen is if we help each other out, and that requires sacrifice of self," he said. Chandler will be back at Fortezza after the trip to write a book about the experience. The We Carry Kevan team wants to produce a documentary film and music of their European adventure.